For this review, I was given ASD Reading (Autism Spectrum Disorder Reading) to use for a year with my son who is on the autism spectrum with Asperger's Syndrome. This fun and easy to use online reading program teaches students with Austism Spectrum Disorder (ASD) how to read, write, and comprehend. 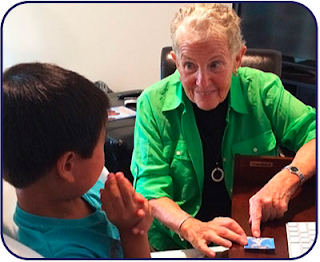 Based on the groundbreaking work of Dr. Marion Blank, ASD Reading is unique in that it offers instruction methods that you don't find in other programs. It requires no prerequisite skills (even non-verbal children can use this program). Graphics, audio, and animation are used extensively in order to reinforce meaning. Written and spoken language are linked together so that one mirrors and reinforces the other. Instruction is customized so that it adapts to each child's specific needs and skills. A child's skills are systematically assessed helping them to overcome difficulties and error patterns. ASD Reading is a completely online reading program. You will need a computer with a mouse or a tablet. You will also need an internet connection. The lessons are short enough to complete in one session. You also have the option to pause the lesson if needed. Once the lesson is completed, your child has the option to continue on to the next lesson or stop for the day. At this screen, your child can continue on to the next lesson or stop for the day. The dashboard enables parents to see each child using the program, the subscription status, when the child last used the program, how many days per week the program was used, their current level within ASD Reading, and the percentage completed on the level they are on. Throughout the ASD Reading Program, your child can score points that will open up their passport. There are 5 different levels in the program which your child will work through. Stars are placed on the passport as points are earned for their completed work. The first thing your child will do when starting the ASD Reading Program is take a placement test. They are placed in the reading program at their level according to the results of the placement test. Once the placement test is completed, assignments are generated and ready for your child to use. Until your child becomes familiar with how the program works, you'll want to supervise them when they are using ASD Reading. To ensure success with ASD Reading, it is suggested that your child uses the program at least 4 days a week. Overall, I am very happy with ASD Reading! I appreciate the progress reports I receive in my email that let me know if my son needs my attention for anything he's struggling with. There is also the dashboard where I can go anytime to get an update on my son's progress within the program and how he is doing. If you have a child on the Autism Spectrum Disorder, I highly recommend taking a look in ASD Reading. You can sign up for a FREE 30-day trial. They also have a Scholarship Program for families who cannot afford to pay for the program that will allow you to use it for free with your child. You will need to sign up first for the 30-day trial and use it with your child for a minimum of 4 days per week for 3 weeks, then you can fill out their form for the Scholarship Program that is on their website.